ER Editor: We also recommend this report from RT titled France recalling ambassador from Rome after Italy’s deputy PM meets Yellow Vest leaders. 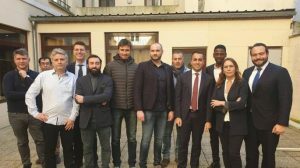 See also ‘Winds of change crossed the Alps’: Italy’s deputy PM meets Yellow Vest ‘leaders’. The French foreign ministry said the decision was taken following a meeting between Italy’s deputy prime minister Luigi Di Maio and leaders of the French Yellow Vest protester movement (pictured), trumpeting his support for the grassroots protests in defiance of President Emmanuel Macron. “All these acts create a serious situation that questions the intentions of the Italian government” towards France.